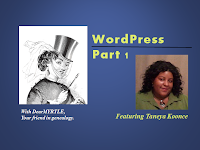 WordPress Part1 and Part 2 webinars are now available in my webinar archive. DearMYRTLE Workshop Webinars are in .mp4 format and can be viewed using Windows Media Player, iTunes and most other media players. Tech support has advised me of this free program that will also play the downloaded webinars. Remember this is the wonky one, where the first part has my PowerPoint not progressing as it should. But never fear, there is GREAT content here. This is the direct link to DearMYRTLE's WordPress Part 1 with Taneya Koonce. This is the direct link toDearMYRTLE's WordPress Part 2 with Taneya Koonce. Thanks, Myrt. Will be tuning in later for Part 3.